Plainsong was established in 2007 to meet the needs of vocalists and clients in Brisbane seeking quality vocal tuition, consulting and performance. Plainsong is a company dedicated to offering personal and individualized delivery of vocal tuition and performance in Queensland and Australia. ASPAH, the Australian Society for Performing Arts Healthcare. Plainsong consultants have current Blue Card compliance. We teach musical theatre, jazz and light pop, classical singing (including opera), and crossover styles. We teach vocal styles appropriate to the music genre being learnt. We do not teach modern r’n’b, heavy rock, or hip hop styles, except where they may be required in musical theatre shows. We prepare students for exams, auditions, competitions and performance opportunities. Our male and female students range in age from 13 to mature adult. We do not accept children under 13 years into the program. Most of our students want to develop careers in music performance, whether musical theatre, opera, or contemporary commercial music. Our studio is geared to those who seek a professional performing career. All students are expected to perform regularly at any one of our concerts, or in the many Eisteddfods available in South East QLD, or to sit AMEB exams throughout the year. Students are expected to practise regularly and to learn their music quickly, and to develop a professional approach to learning. We encourage open communication and discussion where needed. We teach individual students in one-to-one lessons, either weekly or fortnightly. We do not offer group lessons, although we do coach vocal groups and ensembles. We teach to the needs of each student and each lesson is flexibly tailored to the goals of the student on the day. All breath management and vocal technique is geared towards healthy, vibrant singing, and a free, well-supported vocal mechanism. We base our teaching approach on findings from scientific research in singing; through ongoing professional training in singing pedagogy; and through thirty-five years of personal experience in singing teaching and learning. We do not adhere to any one “method” in singing pedagogy, rather, we make use of the best aspects of all to manage the individual needs of each student. We use mirrors for postural alignment, recordings from YouTube clips, clips of the vocal mechanism, and a floor mat for breathing work. We provide some sound files of lessons if requested. We regularly use backing tracks from our select music library and we accompany students on the piano at other times. Our lessons are usually informally divided into vocal warmup; vocal technical development; and repertoire rehearsal. Exam preparation also includes aural perception; character analysis; sight singing and basic music theory. Currently Jessica teaches on Tuesdays, Wednesdays and Thursday afternoons and evenings from about 3.00pm – 7.00pm. She never teaches on Fridays or the weekend, except when running workshops. The studio is based at Norman Park. Dr Jessica O’Bryan, Soprano, and Director of Plainsong Enterprises, is a crossover singer with many years experience in both teaching and performance. She holds a Bachelor of Music Degree in Performance and a Graduate Diploma of Education from Melbourne University, and a Master of Music Degree from Monash University. In 2015 she became a Doctor of Philosophy, awarded by the University of Queensland. Dr O’Bryan taught Singing in the Bachelor of Musical Theatre program at the Queensland Conservatorium and was First Year Head of the 2014 cohort. She is employed as a Research Assistant and Project Manager on a number of research projects at Griffith University and QUT. She is in demand as a vocal adjudicator at Eisteddfodau around Queensland. Her students have reached the semi-finals of such TV shows as Australia’s Got Talent 2010, X-Factor 2012 and Young Talent Time 2012, and at. the Gympie Muster Talent Quest 2012. Other students have been accepted into the Queensland Conservatorium or the VCA. Her students have won a number of significant prizes in Eisteddfodau around Queensland. Her semi-professional and professional clientele have performed in countless shows around Brisbane and Australia, including Les Miserables, Georgy Girl, Cats, Light in the Piazza and many, many others. Jessica performs in corporate entertainment venues as a featured singer. She has sung in rock/pop bands including Hit Squad and Ken Oath Country, and as a jazz singer in bands such as Mood Indigo. She was Principal Artist with Victorian Opera and Opera Queensland. Her last CD release in 2007 was “Irish Songs of Pride”, appearing with Roy Best and Damien Leith. In 2008 Jessica sang with Opera Queensland in the exciting schools project ‘Moving Opera’, and worked with Queensland Opera in their developing opera for teens: Dirty Apple. She is currently working on her new cabaret show: “Failure to Thrive”. Prior to moving to Queensland in 2007, Dr O’Bryan was Head of Voice at Wesley College for six years, where she taught both singing and classroom music. She was also in demand throughout Victoria as an examiner and adjudicator. 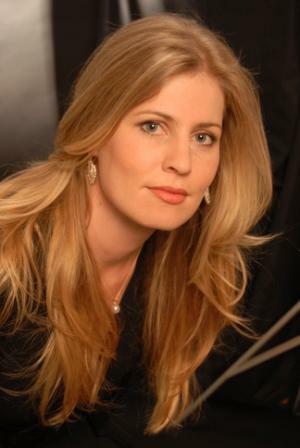 In 2007 Jessica was appointed President of Amuse (the Australian Society for Music Educators) in Victoria, and in November of that year she became Editor of the Voice of ANATS. In 2015 Dr O’Bryan was awarded her PhD from the University of Queensland. She investigated classical singing culture and teachers and students of classical one-to-one tertiary vocal education. She has presented her findings many conferences in Australia and overseas. She is a published author of research in singing teaching and music education, including book chapters and journal articles. In 2018 Jessica and Scott Harrison were contracted by Routledge to write a book on musical theatre education and training, due to be published in 2020. Her current publications include a chapter in: Harrison, S. Ed (2010). Eminent singers’ recollections of learning to sing, in Perspectives on Teaching Singing. Bowen Hills: Australian Academic Press, plus a number of journal articles in IJME, BJME and RSME. 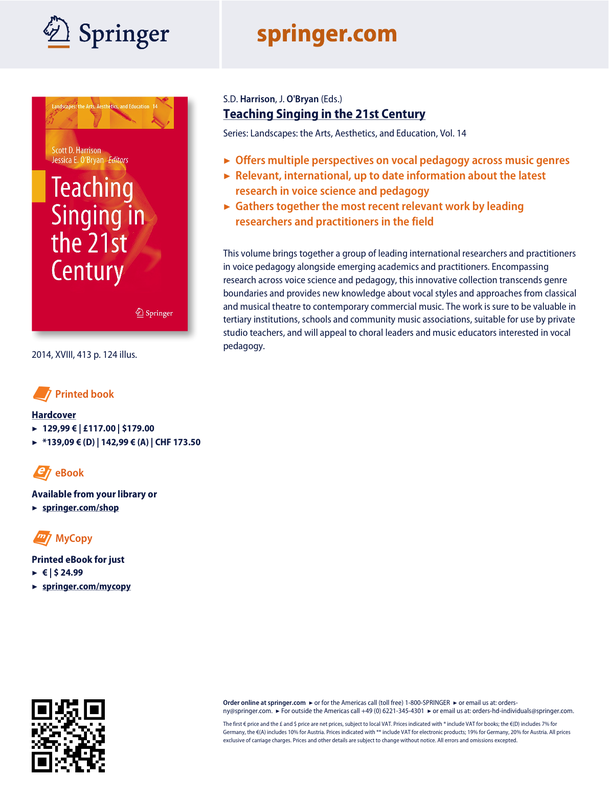 Her most recent book with Co-Editor Scott Harrison titled Teaching Singing in the 21st Century was published in May 2014.